Relationships –Married Quaker lawyer John Todd, Jr. in 1790, and they continued to live in Philadelphia and had two children. In 1793 Yellow Fever swept through the city, killing over 5,000, including John Todd, his parents, and Dolley’s youngest son, just a few weeks old. Married James Madison on 15 September, 1794. Remained married until his death in 1836. Colonel Aaron Burr helped her resolve her late husband’s estate, became guardian of her surviving son Payne Todd, and introduced her to James Madison in the Spring of 1794. They were never lovers due to Theodosia Burr’s terminal cancer and death in late May, 1794. However, they were close friends, and might have eventually married had Madison not snapped her up first. Mrs Dolley Payne Todd Burr would have likely prevented Aaron Burr from the political missteps that resulted in his eventual political downfall and vilification. Patrick Henry was her cousin. Dolley Payne Madison was the eldest daughter of John and Mary Coles Payne, and grew up in Piedmont, North Carolina. A strict Quaker, her father freed his slaves and moved the family to Philadelphia. She married John Todd, Jr, a lawyer and fellow Quaker who died three years later in a yellow-fever epidemic. Beautiful and vivacious, she attracted considerable attention from many eligible bachelors. To the amazement of many, she fell in love with James Madison, the father of the US Constitution. They were married in 1794, and remained passionately in love until his death. 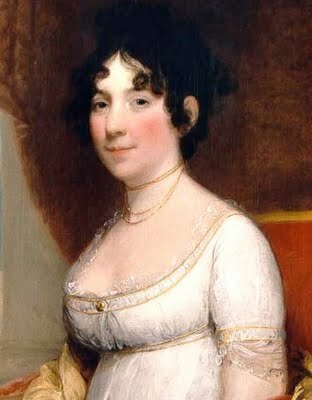 Dolley’s charm, social grace, and political savvy were the perfect complement to James’ somber brilliance. While James Madison was Thomas Jefferson’s Vice President, Jefferson, a widower, delegated to her the task of decorating the newly constructed White House, and hosting innumerable Presidential socials. Dolley continued hosting socials throughout the eight years of James Madison’s presidency. Bitter political enemies would meet, share in the food and pleasant conversation, and come to think of each other as “the loyal opposition”. Dolley never saw herself as the power behind the throne, but rather as the lubricant that kept the government machine from overheating and exploding. Because many of these events included the foreign diplomatic corps, she became known worldwide for fashion and hospitality. Later in life, Dolley was awarded an honorary seat in Congress, permitting her to watch congressional debates from the floor, where members sat at their desks. She was the first private citizen to transmit a message via telegraph, an honor given her by its inventor Samuel F. B. Morse. She presided at the ceremony which laid the cornerstone of the Washington Monument. She received a specially cast silver medallion commemorating her role in the War of 1812. Congress immediately adjourned when notified of her death on 12 July 1849. Dolley received a formal state funeral, presided over by the President and attended by his entire Cabinet, the Supreme Court, most of Congress, and thousands of friends and mourners. It was the the largest ever held in Washington. This was written by Neil Garra. Posted on Monday, March 14, 2011, at 22:09. Filed under Research Tidbits. Tagged Historical. Bookmark the permalink. Follow comments here with the RSS feed. Both comments and trackbacks are currently closed.